It’s been a while since I’ve reviewed a Burial Hex LP yet here is the newest from this now enduring project. Burial Hex is a black noise project focusing on ritualistic and occult elements in dark ambient music. Recently having performed at Existence Establishment’s own Industrial Liberation Festival 2012 the act has really evolved while still staying true to the original vision. Side A begins with thick core of chugging noise – not really harsh – but plodding and all-encompassing. 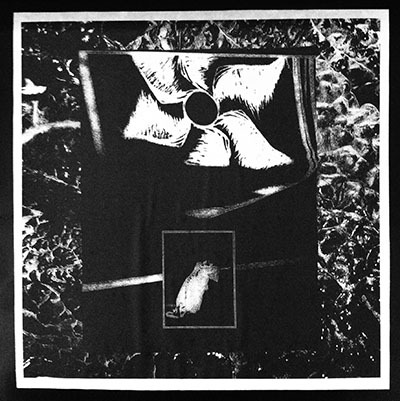 There isn’t much ambience here mostly just thick lo-fi noise but the atmosphere slowly builds throughout the side until finally we are immersed in Burial Hex’s netherworld of metallic clanking, texturally distorted elements, and incessant whispering. There are a lot of cymbal-like moans and tibetan bowl type drones that add some great texture to both the highs and lows. Side B kicks off in a similar vein but follows a very different path. The chugging noise quickly morphs into a low-drone while slowly bent, scraped, and bowed metal sounds begin to work their way in. The distortion level isn’t as high here and the track is actually a lot more sparse at times which is great because it allows the listener to focus in on the individual elements a bit. It also allows identification of the source material that was featured on side A which makes for an interesting game of association. The LP is packaged as a DIY effort with pasted artwork on the back and front cover, a simple sleeve and photocopied insert. My only gripe is the lack of label on the record which makes it annoying to check if you are playing the correct side. Yet, this also comes as a sick limited special edition for the fanatics out there which includes the LP, + an additional package of two C32 cassettes (containing new/unreleased Burial Hex recordings), a 12×12” back-patch, 3 1” pins, and 4 postcards. sleeved, painted, and hand-numbered out of 33 copies *drool*. Great work from this artist and an excellent edition to his prolific body of work.